The legal saga of a whisteblower doctor sacked by Croydon’s NHS trust after voicing fears about patient safety has taken a fresh twist. 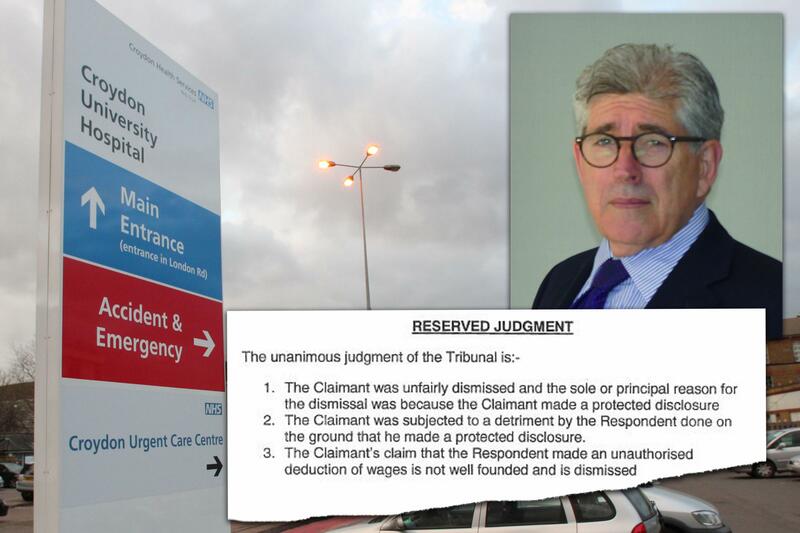 Kevin Beatt, former consultant cardiologist at Croydon University Hospital, has been granted leave to appeal a High Court ruling that he must face a fresh employment tribunal. A 2014 tribunal ruled he had been unfairly dismissed from his job in 2012 after raising concerns about patient safety and staff bullying in the hospital’s cardiac catheter unit, which he ran, following the death of a patient. Croydon Health Services NHS Trust, which runs the hospital, hired a £5,000-a-day QC to fight the ruling. It insists it fired Dr Beatt for making “unsubstantiated and unproven allegations of an unsafe service” and successfully appealed to the Employment Appeals Tribunal, which in January ruled the original tribunal decision had not been “properly reasoned”. But Dr Beatt’s legal team have now won permission to take the fight to the Court of Appeal. He said: “With all the expense involved, it’s just about the most ridiculous decision that can be made when actually what could have happened and what’s happened in other cases is the court has just sought clarification of the judgment, which would have been a very reasonable way to do it, or for them to go back and contest one issue. The hearing is not expected to be heard until April, meaning the legal battle is likely to enter into a fifth year. The trust has spent hundreds of thousands of pounds on legal fees contesting the case and will be forced to pay Dr Beatt a large compensation package if it loses. Dr Beatt, a respected specialist who led the hospital’s well-regarded department for interventional heart procedures from 2007, argued he should have been afforded protected whistleblower status when he made a catalogue of complaints about staffing shortages, “appalling” equipment and workplace bullying, including at the inquest into the death of a patient during a routine operation. But instead he lost his job in a case he claimed provided a damning demonstration of the trust’s attempts to cover up failings. The trust argues Dr Beatt’s allegations amounted to gross misconduct, but 2014 employment tribunal ruled there was “no consistent evidence” of wrongdoing by the cardiologist and concluded the trust had “failed to carry out a fair process”. Dr Beatt, who is effectively unable to work in the NHS while the legal fight is ongoing, said: “Because [the trust] maintains [it] was right it makes it very difficult for me to get a job.